You are currently browsing the tag archive for the ‘J M W Turner’ tag. 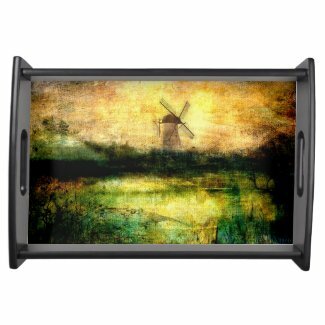 Inspired by the work of J M W Turner, I created Turning Windmill (yes, the part-pun is intentional!) by using one of my textures, one from Kerstin Frank and a photograph of a windmill in Estonia from Wikimedia. When I first posted about Turning Windmill in January 2014, I was not at all sure about it and had yet to upload the image to any of my galleries. But those of you who were following my blog at the time were enthusiastic and I went ahead and put it up for sale. I’ve become very fond of the image and am rather glad I left it as it is. Welcome to Margate … translated. Margate in Kent, a popular seaside resort since the 18th century, is possibly best known these days as the town where artist Tracy Emin grew up. But did you know that it was home to J.M.W. Turner? Although I wasn’t thinking of Turner when I discovered this photograph of Margate and its harbour dated 1897 (Wikimedia), I might have been ‘channelling’ him! The Turner Contemporary gallery in Margate writes that ‘Turner’s connection with Margate was the founding inspiration for our organisation. He loved Margate for the sea, the skies, and his landlady Mrs Booth.’ Don’t you just love it that he was potty about his landlady! In the 1700s, bathing in the sea and drinking seawater became a fashionable cure for all sorts of diseases. From the Georgian period onwards visitors from London began flocking to resorts like Margate for the seawater cure and increasingly as a place to socialise. Margate has built a reputation as a place for bathing in the sea – both for health and pleasure. Margate has a special place in the history of the ‘Bathing Machine’ with Benjamin Beale inventing the modest hood in 1753. This canvas canopy could be lowered and raised by the driver of the machine, allowing bathers a modicum of privacy as well as some protection from wind and waves. Whilst in Margate recuperating from a nervous breakdown, TS Eliot sat at the Grade II listed shelter on Margate seafront and composed the key lines in his poem ’The Waste Land’ – “On Margate Sands./I can connect/Nothing with nothing./The broken fingernails of dirty hands./My people humble people who expect/Nothing”. Margate, was the first place to offer and popularise donkey rides on the beach, starting back in the early 1800s. Originally posted on First Night Design. The other day I was studying an old photograph that I had taken while on holiday in Crete of the Venetian Harbour in Chania. I was wondering what I could do with it. In fact, I’d been looking at it and wondering for some years because it doesn’t stand alone as a photograph. It wasn’t until I was going through my cache of background textures for another piece that inspiration struck. I chanced upon a photograph of moss-covered rock which, combined with the harbour, formed the basis of an image I could work on. A number of tweaks here and several blending changes there (in Photoshop, as usual) enabled me to create this kind of dirty Canaletto-crossed-with-J M W Turner, if you will! via Four Works: Digital Art, Master Photographers & Vintage Delights | First Night Design. First Night Design | Turning Windmill | Your Thoughts? Inspired by the work of J M W Turner, I created Turning Windmill (yes, the part-pun is intentional!) by using one of my textures, one from Kerstin Frank and a windmill in Estonia from Wikimedia. I have not yet uploaded the artwork to any of my galleries as I’m still not too sure about the slightly garish tone. My instinct is to make it much softer. What do you think? Do you like it as it is or would you also prefer a softer aspect? If so, do take a moment to comment below. Thank you. The Gloria Swanson Tattoo was inspired by Edward Steichen‘s well-known headshot of the Hollywood actress covered in lace and held by the Museum of Modern Art. I had remembered it as an image by Man Ray so it is just as well that I checked. Both photographers were renowned for their Hollywood and fashion photography in the 1920s and 1930s. The Swanson photo (Hello-Tuesday) and the vintage wallpaper (MGB-Stock) image I used to create the lace effect are from Deviantart. There’s a rather marvellous shop in Berlin that sells vintage postcards, a shop I discovered a few years ago. Bartko-Reher-OHG’s site provides hours of delight and I have to be strong not to buy up all their stock in any one day! I bought the above Charlie Chaplin postcard about three years ago but it has taken me this long to do anything with it! This last image is a vintage advertisement from The Graphics Fairy which stars the singer and dancer Mademoiselle Vanoni who was, according to an old cutting from The New York Times, dated 30 March, 1885, an exuberant performer. I have no doubt of it!